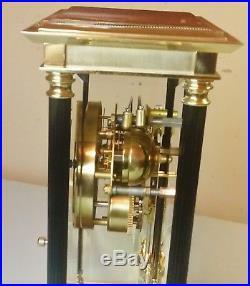 BEAUTIFUL MONTREUX CRYSTAL REGULATOR MANTLE CLOCK. 8 DAY WIND BELL STRIKE GERMAN MOVEMENT. DAINTY DOUBLE BELL DING / DONG STRIKE ON THE HOUR AND 1/2 HOUR. 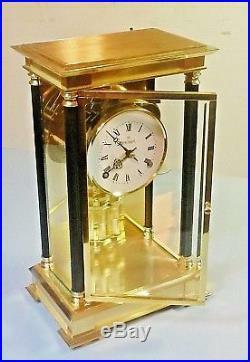 HEAVY BRASS CASE WITH BLACK FINISH BRASS CORNER PILLARS / COLUMNS. BEVELED GLASS FRONT DOOR AND SIDE PANELS. 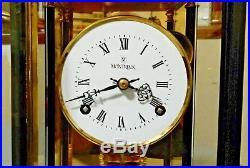 WHITE DIAL WITH BLACK ROMAN NUMBERS / BLACK ORNATE HANDS. 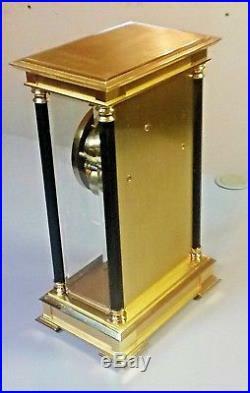 HEAVY BRASS MERCURY STYLE PENDULUM WITH CHROME INSERTS (NO MERCURY). 11 INCHES TALL X 7 INCHES ACROSS X 5 INCHES DEEP APPROX. CASE AND MOVEMENT MADE IN GERMANY. 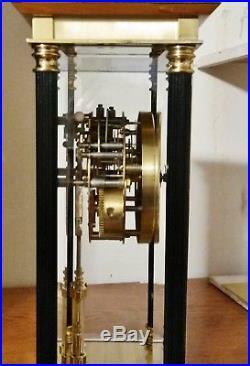 NOT AN ANTIQUE BUT AN OUTSTANDING EXAMPLE OF CRYSTAL REGULATOR CLOCK. IN PERFECT RUNNING CONDITION / WINDING KEY INCLUDED. ASK QUESTIONS WILL GLADLY ANSWER THEM. 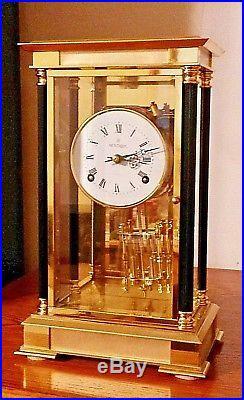 The item "CRYSTAL REGULATOR DOUBLE BELL STRIKE 8 DAY / BEVELED GLASS / HEAVY BRASS CLOCK" is in sale since Monday, October 22, 2018. This item is in the category "Collectibles\Clocks\Antique (Pre-1930)\Shelf, Mantel". The seller is "4youbetking2014" and is located in Glendale, Arizona. This item can be shipped worldwide.